Can you please email me a map of the location of the brush fire that’s been burning for the past week at PTA? Also, why wasn’t air monitoring done down wind of the fire to see what possible toxic particles from 70 years of bombing are in the smoke, including Depleted Uranium (DU) which has been confirmed to have been used at PTA? Mahalo for your prompt response. Below is a short NRC response to questions about the ongoing Pohaluloa brush fire that has been burning for 1 week in the “Impact Area” of 70 years of bombing and live fire in the center of Hawaii Island. The NRC response claims the fire is not in an area containing DU but the reality is they do not know where all the DU is located and how much has been fired at PTA. DU was first used there in 1960. It has not been reported that any air monitoring has been done down wind of the fire to determine what possible toxins are in the smoke. Not by the Army, nor the State Department of Health, Civil Defense, nor EPA, NRC, etc. My experience with the Army is that they have always low balled potential problems. They have not been transparent. For years they denied that DU was ever used at Pohakuloa and other sites in Hawaii until peace activists uncovered legal documents and exposed its use. The NRC, which is suppose to regulate nuclear matters, for the most part has rubber stamped the nuclear industry, much like Bank regulators rubber stamp Wall St. crimes. I consider the NRC response unacceptable. It is based on faulty assumptions and lacks any confident air monitoring data from the present brush fire. In short, if you don’t look, you will not find. The answer to what toxins people, plants and animals may be exposed to is still blowing in the wind and smoke of the Pohakuloa brush fire. 10 millirem per year. The brush fire, if it did impact areas containing DU, would be expected to result in even lower doses than the high explosives training. Brush fire burning on Pohakuloa Military base Impact Area where Depleted Uranium and other military toxins are present. Re: Brush fire burning in Pohakuloa Training Area (PTA) weapons impact area where Depleted Uranium and other militarty toxins are present. 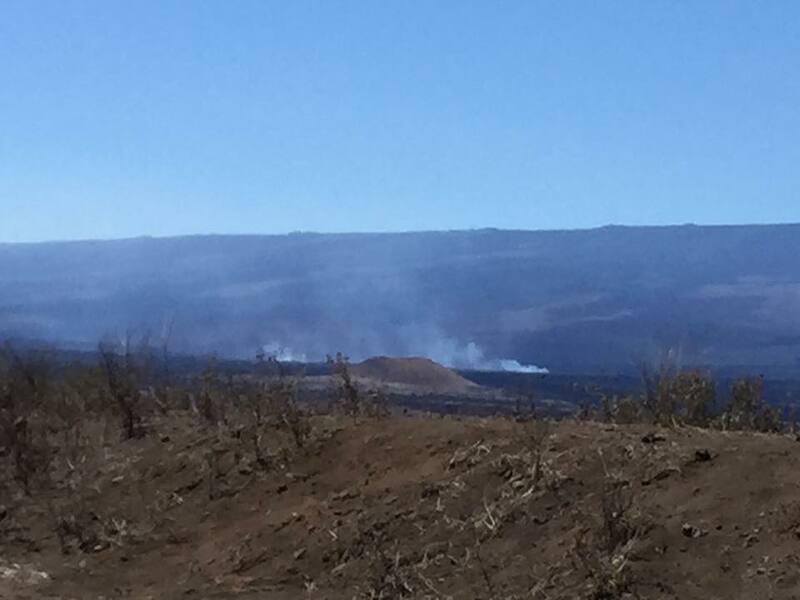 Pohakuloa Fire Captain Steven Coloma 969-2448 just confirmed that a brush fire is burning in the “Impact Area” at the Pohakuloa Training Area (PTA) located in the center of Hawaii island. Currently he said the winds are east to west, but they have been variable, The fire has been burning for several days. Depleted Uranium (DU) rounds have been fired at Pohakuloa yet no air monitoring is being done by the military, the State department of Health, or the Nuclear Regulatory Commission for possible radiation being spread beyond the base in smoke particles that if inhaled are extremely dangerous. Ask Dr. Lorrin Pang, MD (panghi71@gmail.com) Maui County Public Health officer who is retired Army Medical Corps about the dangers of inhaling DU particles. Doug Rokke; Ph.D.; Major, retired/disabled; U.S. Army, former Director, U.S. Army Depleted Uranium project Dlind49@aol.com, said the following upon hearing of the brush fire on Pohakuloa. “just frigging wonderful. army leaders neither care about human health nor the environment and that will never change. the mess goes right back to the march 1991 defense nuclear agency memo and the march 1 1991 los alamos memo directing all and specifically me as i began the desert storm depleted uranium friendly fire clean up- to lie in our reports to avoid any accountability for adverse health and environmental effects and thus sustain weapons use. I, Jim Albertini, have put calls and emails into the Dept. of Health director’s office Virginia Pressler 586-4416, ginny.pressler@doh.hawaii.gov and Amy Snyder of the Nuclear regulatory Commission 301-415-6822, Amy.Snyder@nrc.gov and left messages for immediate air monitoring around Pohakuloa. No response. County and state public officials have been asked to intervene for action to protect public health and safety. Below is a copy of an information sheet on the issue that will distributed via the internet today and handed out in downtown Hilo this Friday and Saturday around Merrie Monarch events. The Pohakuloa Training Area (PTA) is a 133,000-acre live-fire military base located in the center of Hawaii island. Military documents say that up to 14.8 million live rounds of various munitions are fired annually at Pohakuloa — everything from small arms, machine guns, artillery, rockets and bombs. B-52 and B-2 bombers fly from Missouri, Louisiana and Guam to bomb at Pohakuloa. All branches of the military train there. Even other countries are invited by the U.S. to bomb Pohakuloa. The military has confirmed that Depleted Uranium (DU) radiation rounds have been fired at Pohakuloa beginning in the early 1960s. But it says it doesn’t know how many DU rounds have been fired at Pohakuloa, where they were fired from and where they landed. The Army says wherever the DU is located on Pohakuloa, and other sites in Hawaii, it will stay there and is safe, although it is prohibited from being used in military training today. Explosions and brush fires can burn DU resulting in fine smoke-sized particles being blown by the wind over an unsuspecting public. Medical experts, say DU is extremely dangerous when inhaled. It can cause cancer, birth defects, and genetic damage. Retired Army Major, Doug Rokke, Ph.D., former director of U.S. Army DU Project, says the Army is ignoring its own regulations. AR 700-48 requires emergency response using TB 9-1300-2378 and specific medical care for down wind DU smoke fire exposures and definitive medical care for airborne exposures. At a minimum, the military, the Hawaii Dept. of Health and the Nuclear Regulatory Commission (NRC) should be conducting continuous air monitoring around Pohakuloa for radiation being spread off of the base, but they are asleep at the switch. So too are most county, state, and federal elected officials. The U.S. military needs to stop desecrating and contaminating Hawaiian lands, clean up its mess, and then end its illegal occupation of the Independent Nation of Hawaii. It’s up to all of us to build that people’s movement for action. Aloha ‘Aina! Stop the Bombing! WARNING – Brush Fires at Pohakuloa – Possible DU aerosols blowing downwind! You are asleep at the switch. You should be on top of this but you are not. Shame on your criminal negligence. 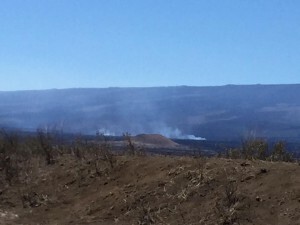 WARNING – Brush Fires at Pohakuloa – Possible DU aerosols blowing downwind! Is anyone monitoring? Hawaii Dept. of Health, Civil Defense, the military (mongoose in the hen house)? I watched this shocking video. It appears that the Israeli soldier who carried out the execution was following an order. No other soldiers appear to have raised an objection. Shameful.